This wall forms part of the church at La Santísima Trinidad, a mission complex built under Jesuit direction for, and by, Guaraní in Paraguay. 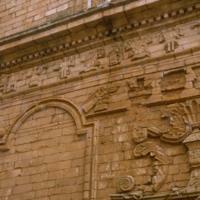 The adornment of church walls with relief sculpture was supervised by Jesuit fathers but most often executed by Guaraní craftsmen. This section includes an urn with a shell and foliated motifs, and rows of music-playing angels above. Both motifs would have had their origins in European imagery. 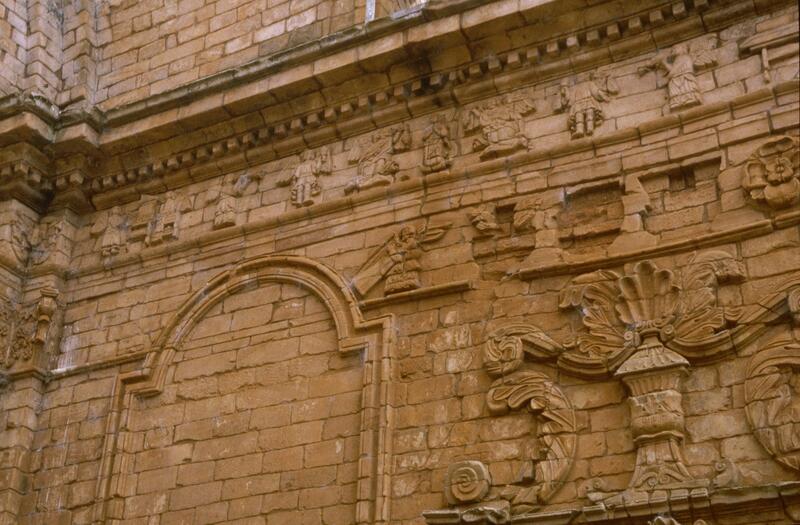 On the Jesuit missions, not only did the Guaraní carve images of music-making, many learned to play instruments and performed musical works for the church. One of the Jesuit missions among the Guaraní in Yapeyú served as a conservatory, training talented Guaraní from the region. On this frieze, many of the angels are shown playing instruments of European origin, like the trumpet or horn on the right. These angels suggest the celestial music of the Christian heavens. The carvings upon this church wall speak to the fusion of arts that came together in worship—not only visual arts, but musical performance was among the expressions of faith the Guaraní were encouraged to develop by the Jesuit fathers who lived among them.